Two 20cm x 5cm (8in by 2in) round pans are recommended for this recipe. You can use any shape or size cake pan you want, but the brownie will turn out flatter or higher, depending on what size you use. You can also make this recipe into cupcakes. 1. Preheat oven to 180 C. Place rack in such a way that the brownies will be baked in the centre of the oven. 2. Grease the cake pans with oil or line with buttered paper. Cut tracing paper to fit inside the cake pan, then grease again. 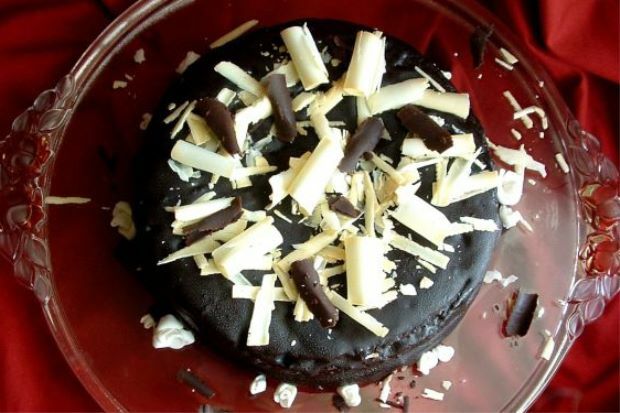 It is necessary to flour the pans when baking with chocolate. Put some flour in the cake pan, then tap and shake until the insides are completely coated. Tap out excess flour into next pan, repeat, and discard the rest of the flour. 3. Measure out ingredients in bowls. Sift the flour into a bowl over the weighing machine. 4. Pour water into a saucepan and bring it to a boil. Then remove from fire and add in the cooking chocolate. Once the chocolate is added, put the saucepan on the stove and allow the mixture to boil. Then let it simmer for five minutes, stirring constantly with a wooden spoon, until the water has mostly evaporated and mixture is very much thickened. It should have the consistency of pudding. Scrape the mixture into a large mixing bowl using a spatula. 5. Before the mixture cools, add in all the butter. It should separate from the chocolate at first, but as chocolate cools and butter melts, whisk it gently. It will soon be smooth, glossy, and mouthwatering, like ganache icing. It will peak a little when the whisk is lifted. 6. Break the eggs, add in the sugar and whisk mixture with an electric beater until foamy, but does not hold peaks. 7. Fold in the egg mixture with the whisk gently. Before the egg mixture is completely incorporated, fold in flour, salt, and chocolate chips quickly and evenly until the flour is just incorporated. The batter will be brown in colour and lumpy. 8. Pour and scrape batter evenly into the cake pans. You can use a weighing machine to ensure that the batter is evenly distributed. 9. Fold sheets of newspaper into long strips the height of the pan, wet them thoroughly and wrap around sides of the pan. This will prevent the brownies from doming. 10. Bake the brownies for 30-40 minutes, or until a toothpick inserted comes out clean, and a small amount of butter is bubbling on the surface. While the cake is baking, clear the kitchen and make the ganache icing. Do not wash the saucepan yet; use it again for this. This ganache icing brings out the best flavour of the chocolate and is easy to make. Repeat steps 4 and 5 from the brownie cake, only using the above ingredients. Instead of glazing this brownie cake with sugar syrup, use a diluted (but still flavourful) version of the water ganache. 1. Weigh 100g of the water ganache into a small pitcher/glass. 2. Pour in ½ cup of milk a little at a time, straight from the fridge, whisking constantly. The glaze will not look very chocolaty, but tasting it will tell you otherwise. 3. When the brownie is done, immediately poke holes all over using a metal skewer while it is still hot in the pan. Pour the glaze over and spread. 4. Let the brownie soak in the glaze, and then turn a knife gently over the sides to release it from the pan. Overturn on a rack and peel off tracing paper. Place the rack over a tray to collect drippings. 5. Glaze the sides of the brownie, and repeat step 3 on its bottom side. Spread a little of the water ganache over one of the brownie layers. You may sprinkle some nuts on the centre of the cake if you like. Overturn the second brownie layer on top of the first one. Spread the ganache all around the sides of the brownie. The ganache will harden to a truffle-like consistency. Use a spatula to make sure the cake is iced evenly, then transfer it to a cake board or plate using a spatula. You can grate some white and dark chocolate into curls and arrange them on the brownie. You can also use edible flowers and arrange them around the brownie.